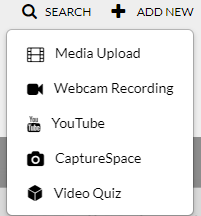 Click on the Add New button to view the available menu-options. 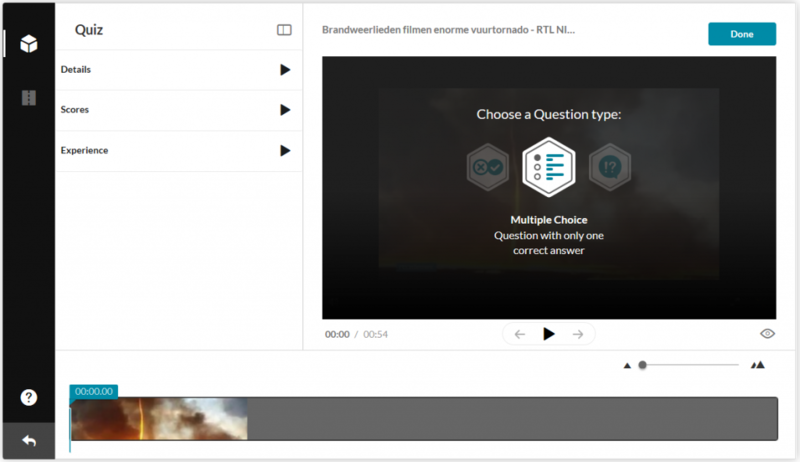 Click on ‘Video Quiz’ to create a quiz based on existing media from your ‘My Media’ list. Wait for the ‘Editor / Media Selection’ section to load. 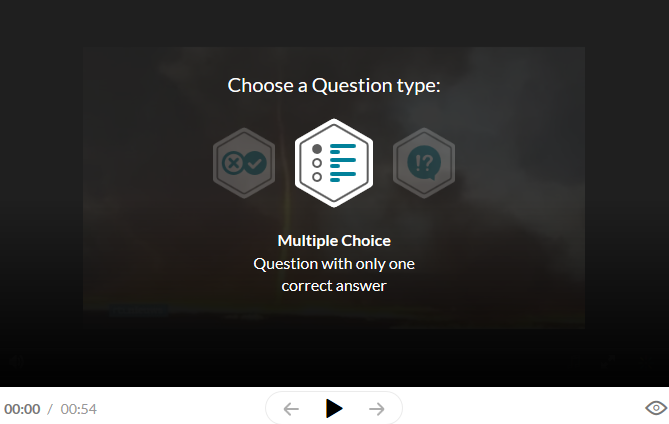 Click on the ‘Select’-button next to the video you would like to use to create a quiz for. Wait for the ‘Quiz Editor’ to load. Press ‘Start’ to create a new quiz and wait for the window to reload. Enter a name for the quiz at ‘Quiz Name’. Enter a welcome message at ‘Welcome Message’ for candidates to see | NB: If you wish not to show a welcome message you can deselect the tick for ‘Show Welcome Page’. 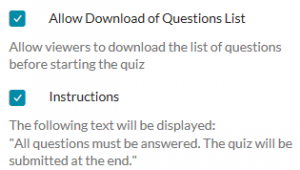 The option to download the quiz questions prior to starting the video is selected by default, deselect this if you do not wish this to be available. The instruction telling candidates to answer all questions is also selected by default, turn this off by deselecting the tick if you do not wish this option to be set. Click on the ‘Score’ tab. 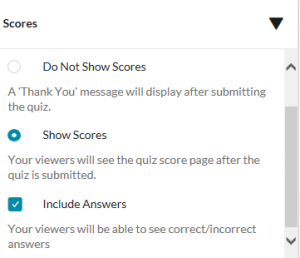 Choose between ‘Do Not Show Scores’ and ‘Show Scores’ (‘Show Scores’ is selected by default). Deselect the ‘Include Answers’ if you do not wish to show the answers at the end of the quiz. Click on the ‘Experience’ tab. Deselect the ‘Allow Answers Change’ option if you do not wish for the candidates to be able to edit their answers after they entered their initial response. ‘Skip For Now’ is selected by default to give the users the option to answer a question at a later time. 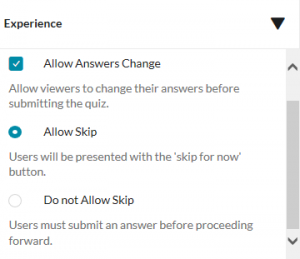 Set this to ‘Do not Allow Skip’ if you want the users to answer the questions immediately! 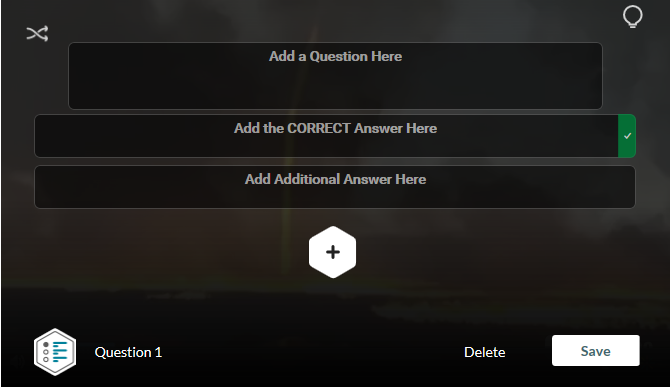 To add questions to the quiz you should first select a moment in the timeline at which the question should be shown. You can do this by either playing the video and pausing it at the right moment or by clicking on the tmeline. You can select a queston type by pressing left or right of the highlighted question type. When the right question type is highlighted click on the highlighted type to create a question of that type (Multiple Choice, True/False of Reflection Point). | NB: A Reflection Point is a moment at which you can ask or confront the viewer with what they have been viewing. In the next screen you can enter the question and its answer. 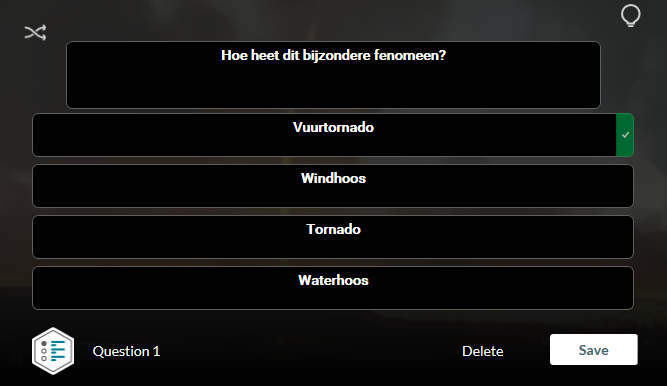 When opting for ‘Multiple Choice’ you can enter multiple incorrect answers by pressing the + sign (max. 4 answers including the correct one). | NB: For ‘Reflection Point’ there is an exception as this does not have a question/answer mechanic. When you are done creating the question and its answers, press ‘Save’. You can always edit the question by pressing on the ‘cube’ icon in the timeline as well as edit the timing of the question by dragging the ‘cube’ over the timeline. Repeat the previous steps (selecting a moment in the timeline and adding the question and answers) to complete the quiz. When ready you can press done to finish setting up the quiz (on the right hand side above the video). 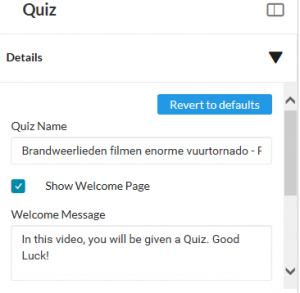 In the new screen you can choose to go back to the media page (‘Go to Media Page’) or continue editing the quiz (‘Edit Quiz’). | NB: the video on this screen is not the quiz, you can view the actual quiz from the media page when you select ‘Go to Media Page’.